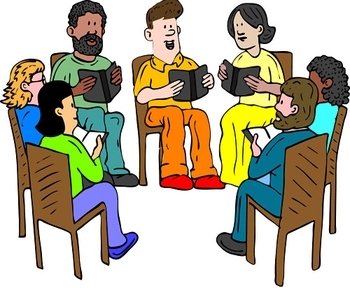 I’ve been in a book club – sometimes more than one – for most of my adult life. These clubs filled a void that opened up when I left school. I got to read, and explore, books that I might not otherwise have read on my own. I got to reconsider the books I already was reading with a deeper, fresher eye. I also got an afternoon or evening out, and in some cases, a nice spread, a good glass of wine, and, as a side benefit, camaraderie, even genuine social support. But my friend’s remark made me realize that book clubs were not for everyone. They were not even for every person who adores dissecting and discussing books. The many book clubs I’ve belonged to weren’t for everyone either. Some weren’t even so perfect for me. It’s not just literature professors who snub book clubs. Many spouses do, too: a running joke in many all-women clubs is having to prove to husbands that books are actually being discussed at these gatherings. However, I’ve been in book clubs of all sorts, some open to all ages and genders, some devoted to heavy classic tomes, and some more decidely of the white wine variety. Is it the conversation, the intellectual stimulation, the exposure to books you’d never read on your own, the people, the escape from cooking, or the chance to get out of the house or ecape screaming toddlers? Is it the support network? Being forced to read? Or the neighborhood gossip? Is it, really, the wine? I realize that most people will have more reason, and that the reasons may vary from one club to the next. But let’s just say, right now, that you have to name the main reason you’re in a book club. If you’re not in one, what’s the main reason that you would like to join one? Or, if you have no interest in joining a book club, why not? I want to know – and I’ll feature some of the answers next month. Please share responses via the comments section below, the contact form on my website, my Twitter account (@terraziporyn), or the Late Last Night Books Facebook page.